Overview : The daunting scale of Delhi becomes more manageable as you start to appreciate that geographically as well as historically it consists of several distinct cities - if anything, more than the Seven Cities of tradition. The hub of the metropolis is Central New Delhi, an orderly plan of wide roads allied with sturdy colonial buildings which was established as the capital of British India in 1911 and which includes the columned facades of Connaught Place, and the parliamentary buildings - the architectural jewels in the Imperial crown. Old Delhi, the Moghul Emperor Shah Jahan’s seventeenth-century capital, lies 2km or so further north. This is Delhi at its most quintessentially Indian where the traditional lifestyle of its predominantly Muslim population has changed little over two hundred years. A visit to Old Delhi's largest mosque is a must and should be combined with a stroll through the old city’s old bazaars, a warren of clustered houses, buzzing with cosmopolitan and infused with aromatic smells, drifting from open-fronted restaurants, spice shops and temples. Further south, the other five of Delhi's ex-capitals are today all but deserted, standing as impressive reminders of long-vanished dynasties. 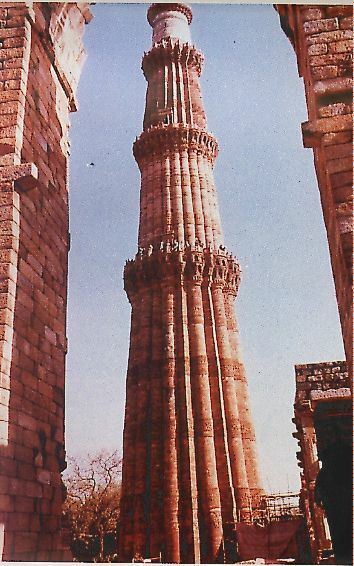 Among them you'll find the towering free-standing column erected by Qutb-ud-din Aibak, the Qutb Minar (twelfth century), that marks the first capital, Dhillika, and that signalled the development of the city visitors see today. Walls and dilapidated pillars survive from the fourteenth century city of Tughlaqabad, and Purana Qila, the sixth capital. Interspersed between these historic ruins are the grand tombs of Delhi's former rulers, of which the finest expressions of the Mughal's architectural genius were the grand charbagh (quartered garden) mausoleums of Humayun's Tomb. Nizamuddin, Mathura Rd (daily, dawn to dusk). The mausoleum of Sufism's greatest saint, Sheikh Nizamuddin Aulia (1236-1325). Every Thursday evening, haunting religious song and music are played in the courtyard surrounding the tomb. Rajpath. Megalithic imperial architecture crowning Raisin Hill: Lutyen’s Rashtrapati Bhawan and Baker’s symmetric Secretariats and parliament. At the other end of Rajpath stands India Gate. Old Delhi The twin red sandstone and marble monuments marking the opulent epicentre of Shahjchanabad, the Delhi capital of the Moghul Emperor, Shah Jehan. (Daily, dawn to dusk; Red Fort admission Rs 2; Atini Masjid is free).